It is official: Luis Severino will start the 2018 AL Wild Card Game tomorrow night. Aaron Boone made the announcement at this afternoon’s workout at Yankee Stadium. “I think he’s ready for this. Hopefully he can get us off to a good start tomorrow. When he’s pitching at his best, he’ll be the best pitcher on the field tomorrow,” said Boone. Severino last pitched last Tuesday, so he’ll go into the Wild Card Game on seven days rest. He’s thrown two bullpens since then to prepare for tomorrow’s start. 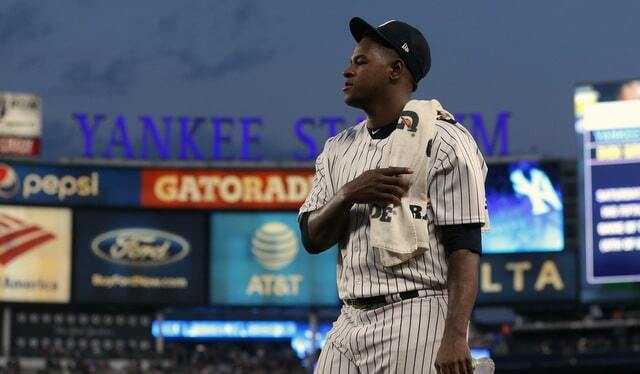 The Yankees skipped Severino’s start Sunday — he didn’t even throw a token tune-up inning or anything — which was a pretty good indication he would get the ball in the Wild Card Game. Three weeks ago RAB readers picked Masahiro Tanaka to start the Wild Card Game, but that was three weeks ago. Things change. I felt the Yankees wanted to start Severino in the Wild Card Game all along, and, after closing out the regular season with two strong starts, he made it an easy call for the brain trust. The Yankees are going with their most talented pitcher. Severino of course started the Wild Card Game last season, and it was a disaster. Three runs and one out. The 2018 Athletics are much better than the 2017 Twins, and the A’s did put a hurtin’ on Severino last month (six runs in 2.2 innings), but he is the Yankees’ best chance at a dominant bat-missing start. How long will his leash be? I guess we’ll find out. Tanaka, J.A. Happ, and Lance Lynn will all be on the Wild Card Game roster, Boone announced. They’re going to carry ten pitchers. Kyle Higashioka and Tyler Wade will be on the roster as well. Wade will be the designated pinch-runner. Based on the math, it appears Greg Bird and Ronald Torreyes will not be on the Wild Card Game roster. Stephen Tarpley is still with the Yankees — that’s not nothing, most September call-ups are sent home after the end of the regular season — and he told Lindsey Adler he does not expect to be on the Wild Card Game roster. He is likely to be on the ALDS roster should the Yankees advance, however. That makes sense. Matt Olson is the only LOOGY worthy hitter in the A’s lineup and he’d be lifted for pinch-hitter Mark Canha (152 wRC+ vs. LHP). Sonny Gray is not on the Wild Card Game roster. “I’m just hanging out,” he told Susan Slusser. No surprise here. Gray pitched too poorly for too long to be on the roster. That said, he’ll remain with the Yankees in case an injury replacement is needed at some point this postseason. Based on today’s information, it appears this will be the 25-man roster the Yankees take into the Wild Card Game. Again, the official roster does not have to be submitted until tomorrow morning. The Athletics have not yet announced their starting pitcher for tomorrow’s game — we should find that out later today, when they have their workout at Yankee Stadium — though all indications are they will bullpen the game. Liam Hendriks is the obvious candidate to be the opener. Update: Hendriks is indeed starting (opening) for the Athletics tomorrow, the team announced. It’s likely to be a one inning and done appearance like pretty much all his starts down the stretch.